Joseph Howe was not yet a famous politician when he travelled far and wide throughout Nova Scotia in his position as editor of the Novascotian newspaper, collecting accounts for his business. From 1828 onwards, he published a series of travel sketches in the paper, comprising his “Western Rambles” from Halifax to Digby, and his “Eastern Rambles” to Guysborough via Truro and Pictou. These made clear his love for the people and places throughout the Province, and recorded vivid impressions of landscapes and the character of Nova Scotia and Nova Scotians. These first-hand accounts, later edited by M.G. Parks and published as Western and Eastern Rambles: Travel Sketches of Nova Scotia (Toronto: University of Toronto Press, 1973) provide a perceptive and enthusiastic literary record of the Nova Scotian countryside and people in the 1820s and 1830s, at a time of rapid demographic and industrial change to the cultural landscapes of the Province, driven by immigration, new and expanding settlements and new technologies. Nova Scotia would never again be the same, and Howe’s Rambles capture it, and his deep feelings for the Province and its people, at a unique moment in time, and prior to his later fame as a politician. 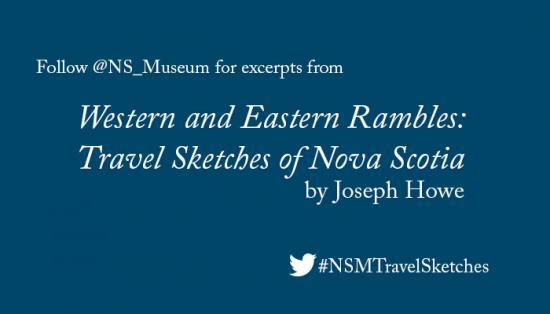 Join us on Twitter (and #NSMTravelSketches) where we will be sharing excerpts from Western and Eastern Rambles: Travel Sketches of Nova Scotia as we count down to Heritage Day, February 15 2016, celebrating Honouree Joseph Howe. Visit 2016 Heritage Day Activities and Experiences for details about in-person and online activities dedicated to Joseph Howe and Heritage Day.